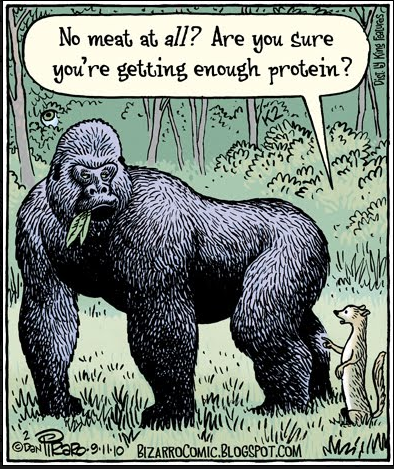 Vegan protein is as misunderstood as the Sasquatch! From hair dressers to lawyers, dietitians and doctors, when I admit to being a vegan, the standard response is a furrowed brow, concerned eye contact and the question “What do you do about protein?” If I’m lucky, I might even get a pat on the shoulder or a squeeze of the elbow. What is the biggest misconception since people thought the world was flat? 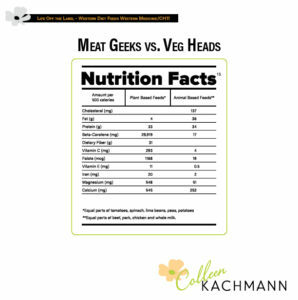 Meat is protein and protein is meat. Since everyone says so, including your doctor, your mom, Carl Atkins and Uncle Sam. It’s the Truth, by popular demand! If you haven’t purchased The China Study, consider investing in this page turner. It offers the most extensive survey of global nutrition ever conducted. More than 8000 statistically significant associations exist between various dietary factors and disease. The correlations and conclusions are scientifically reputable, reproducible and revolutionary: People who eat plant based diets are the healthiest, and societies that eat more animal-based foods suffer more chronic diseases.According to the respected authority in the World Health Organization, research indicates we only need about 5 percent of our diet to be from protein; they recommend consuming no more than 10 percent. Plants (grains, fruits, vegetables, nuts and seeds) not only provide more than enough protein, but also fiber, antioxidants, enzymes, vitamins and nutrients free of harmful fats and cholesterol that promote disease. Consider the following info found inThe China Study, Chapter 11, Principle #3, p230. When you examine the evidence, I’m not sure how anyone can refer to a vegan diet as “restrictive”. On the contrary. 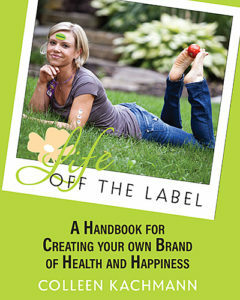 But nutritional needs are not simple, and deficiencies can be present in every diet. But the Standard American Diet (SAD), full of processed, even if fortified, grains, low quality meat and dairy contaminated with hormones, antibiotics, pesticides and preservatives has NOT ONE benefit over a diet of a wide variety of fresh fruits, vegetables and whole grains. There is no competition. One of the cleanest and highest quality sources of protein are sprouts, perfect for daily consumption. They have high amounts vitamins A, B, C, E, K, contain more calcium than cow’s milk and contain all of the essential amino acids. Like the “incredible, edible egg”, they are a complete protein only without all the cholesterol. They are a superfood, and can be added to almost everything. 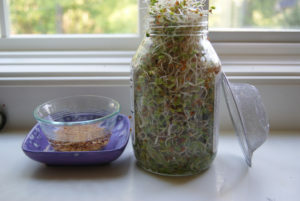 Click here and learn how to grow sprouts in your kitchen. I really enjoy your blog. I think it is very important that people understand that you don’t have to sacrafice protein or energy by becoming vegan or just eating healthy in general. Look at Arian Foster the RB for the Houston Texas, He has recently gone Vegan, and he has stated that he has more energy in the past two seasons then ever before. Thanks again for your informative site. Thank you for the compliments. I agree that there is a lot of misinformation out there, most of it originating from corporations that profit from their own advice. Being vegan for 3 years, I do take B12 and (non-vegan) fish oil because blood tests revealed chronic deficiencies. But otherwise, my diet has kept me energetic, strong and happy. I seriously don’t get sick, and I feel so healthy. a greatly improved body chemistry and consciousness.